Lisa Scootline’s thrillers are classics of the genre, and she returns with One Perfect Lie, where things are not as they seem from the outset. Chris Brennan is the perfect teacher to step into the role of teaching government in the high school, as well as coaching assistant for the small town of Central Valley, PA. 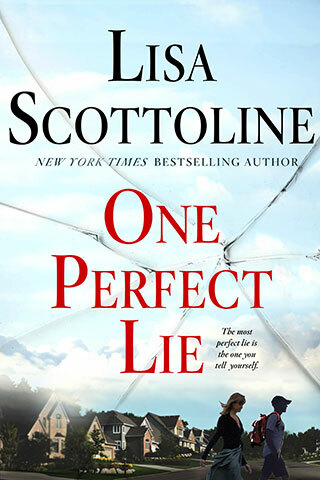 It is to Scottoline’s credit that the real purpose of his application is hidden from readers at first, as everything he’s told his new principal is a lie. And lying is what Chris is particularly good at. Small town life springs alive as we meet three very different families and the secrets they hide. Chris has a hidden agenda, and his classes and his coaching are set up to allow him to find which young student he can bring on side–but to what purpose? What is the dark reason behind his actions that drives him, and how will that affect these three young men, and the entire town? The baseball team is important to this community and to these three families in particular. There’s the surgeon’s wife whose spoiled son drives a BMW to school while she indulges in too many G&Ts; the new widow whose talented pitcher son needs the scholarship he’s after, just as he searches for a new father figure; and the single mom whose shy son, also talented, may allow him to be easily influenced by darker forces. Which one is most at risk? And from whom? The pace keeps ratcheting up as the book progresses, until there’s an almost cinematic climax, worthy of the big screen and an action movie. But there’s also heart and emotion that allows readers inside the lives and minds of the characters, and that’s a winning combination, even as the anticipation escalates. A fast-paced, satisfying read.